Dance is a universal concept, not limited to any one culture or age group. It can give so much to so many people, whether that is by partaking in the art form or by watching and enjoying from the sidelines. Dancing can take on many forms; it could be a once-a-week ballet class to work back to a childhood dream, it could be a ballroom class in order to meet new people, or a contemporary class to deposit some of that creative energy somewhere. And then it could be a monthly treat to visit the local theatre to see visiting productions or it could be teaching an older generation how to trust their bodies again. Whatever your reason for enjoying dance, it is a very individual one. The reasons dance teachers train and teach their own classes is very different to a career in company management, and very different also to an aspiring performing artist starting to audition for jobs. Despite this dance can be the element that brings people together in a community, as it is how groups celebrate after wedding ceremonies and it makes so many people happy. On a scientific level the exercise of dance releases endorphins which positively affect the body, and equally watching dance can bring about this same feeling of contentment. Why do you enjoy dance? The reasons can be wide-ranging. 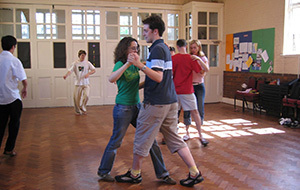 Dance and the performing arts can offer much release from everyday life, thy can offer friendship and fun. For some the hard work and graft of dance are the enjoyable means to an end in which they aspire to become a professional dancer yet for others it is a way to use the body and feel free for a few hours each week.